The far-right paramilitary organization led by the police officer’s killer at Bőny, Hungary had ties to Russian diplomats, sometimes they even held joint airsoft drills. GRU, the Russian military intelligence service was also related to those photos (showing T-72 tanks close to the Ukrainian border) that appeared 2 years ago on a website launched by Győrkös and his radical right-wing group. These photos also gave a handle to the Kremlin to smear the Hungarian government. Even the parliament’s National Security Committee had to have a meeting as a consequence of the “tank-scandal“ in 2014. Tibor Navracsics, the Hungarian foreign minister at the time said that it was “an unfriendly gesture” from Moscow. After that, the website of the Győrkös-related group soon became the main Hungarian-language source of Russian propaganda and received a Russian domain too. Members of the Russian military intelligence service, the GRU ("Glavnoye Razvedyvatel'noye Upravleniye", Main Intelligence Agency) were in contact with the MNA ("Magyar Nemzeti Arcvonal", Hungarian National Front), a neo-nazi organization founded by István Győrkös. Several independent security sources have confirmed to Index.hu the existence of these ties. 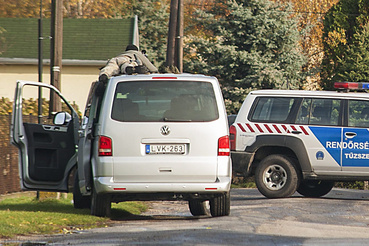 According to our sources, even Russian diplomats have participated in the airsoft drills organized by the gang of Győrkös, about which the Hungarian intelligence services and military counter-intelligence also knew. 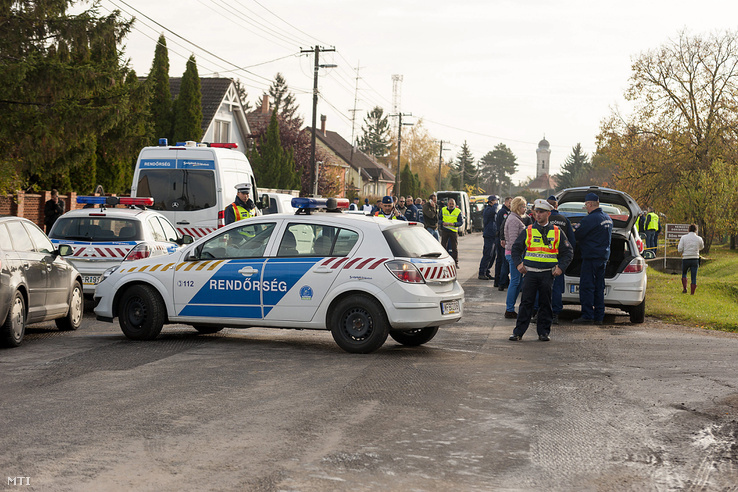 The National Bureau of Investigation ("Nemzeti Nyomozó Iroda", the Hungarian FBI) was supposed to search István Győrkös’s house earlier this week, but when the officers showed up at his home the 76-years-old man opened fire at them, and a 46-years-old police officer died in the shooting immediately. Russian diplomats and members of the Russian military intelligence, the GRU have been around the Hungarian militant subculture for years, albeit not only around MNA. This started well before the eruption of the Russian-Ukrainian conflict. The Russians were trying to do it in a smart, less ostentatious way. Events and activities like relic hunts (of WWII weapons) and flea markets related to that proved to be useful occasions for establishing and maintaining such relations. “Private hunters” and collectors from both the radical right and left were guests of these events frequently, just like the agents of GRU. Since it is a “subculture in move”, the overlaps between people from different organizations made the work for the Russians easier. In most cases, radical people and groups used by the Russians do not even know that they are being indirectly manipulated and influenced. The most ideal ones are the wacky, useful idiots because they are the easiest to influence and to convince them to commit violent actions. During the “trainings” of MNA, they usually held airsoft drills that were sometimes even attended by Russians. It is not illegal to do airsoft in Hungary, it is rather considered as a free-time activity. Consequently, just because some people use it for trainings similar to that of the military, in reality it is just about as dangerous as playing paintball. A wide range of airsoft weapons are available in Hungary, but their trading requires permission, and certain types could be issued only after being inspected by authorities. The difference between airsoft and paintball is that airsoft guns look like firearms, and sometimes their working mechanism is very similar to that of real weapons. The ties of Győrkös and his organization to the Russian intelligence services could be detected on a website called Hídfő (Bridgehead) also. Originally, the webpage was launched by the MNA in 2012. Tellingly, the first Facebook-post of Hídfő.net in September 2012 was written in Cyrillic characters: Новый новостной сайт запущен! – this is how they announced the start of their new website. At the beginning, it was Győrkös’s group that uploaded its content. 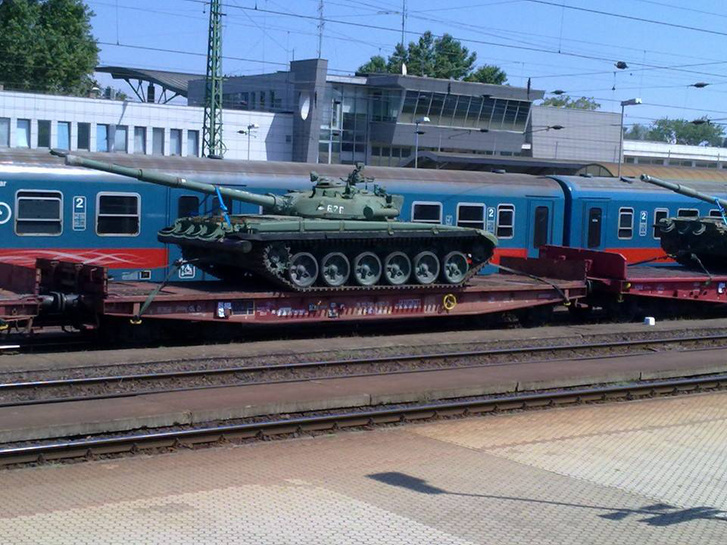 The website became well-known when the Russian foreign ministry accused Hungary of transporting weapons – T-72 tanks among others – to Ukraine in August 2014. The Russian foreign ministry was referring to an odd article of Hídfő, a website known only by the radical right-wing subculture at that time. The website published three “reader submitted photos” that were taken of Hungarian T-72 tanks probably on the 2nd August at Nyíregyháza. Index.hu learned that the Russian intelligence had a hand in the making of the photos. The case was discussed by the national security committee of the Hungarian parliament too. According to our information the government had full knowledge of the Russians being behind the tank-scandal. It is also implied by the fact that after the scandal, the Hungarian leadership expressed their displeasure to Moscow. “It is by all means bizarre that a news appears on an insignificant website and the Russian foreign ministry responds to it on its official website” – said Tibor Navracsics, the Minister of Foreign Affairs at that time. During the committee meeting, Navracsics described Russia’s move as an unfriendly gesture. Later, contradictory news appeared concerning the fate of the tanks. Hifdfo.net refers to three readers’ photos that were taken of the T-72 tanks at Nyíregyháza on 2nd August. The website which was a seemingly Hungarian far-right organ at the time of the tank-scandal was also an unambiguously pro-Kremlin site. Currently, it functions as an organ solely for Russian war propaganda against Kiev and for disinformation. There is no content about the MNA anymore, only pro-Kremlin propaganda, and the site even moved to a new Russian domain, Hidfo.ru. Surprisingly, the website has also confirmed after the gunfight at Bőny that it was István Győrkös who "was attacked in his home" by the police. At the time of Hídfő’s launch, it was already an open secret within the far-right that Győrkös’s organization had close ties to Russia. The ties were so close that it had a prominent role in the 2012 split within MNA. One of our sources familiar with the Hungarian far-right has told Index.hu that besides “the questioning of Hungarianism’s (the Hungarian version of Nazism) Christian basics and Győrkös’s imprudent infatuation with Russia”, a quarrel over financial settlements also contributed to that they turned away from Győrkös. Several members of the leadership of MNA at that time had a dispute over financial issues with one of Győrkös’s sons. According to the leaders, who were later proclaimed as separatists, the elder Győrkös was foaming at the mouth so much that he labelled everybody who brought up the issue as a traitor. 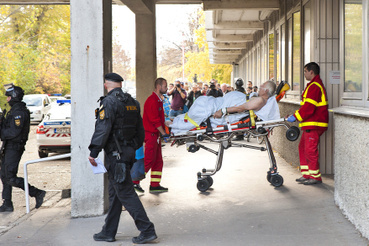 The video shows Hungarian anti-terror forces (TEK) capturing István Győrkös after the shooting. Apart from that, Győrkös’s close ties and movement towards the communists, specifically to the Hungarian Workers’ Party ("Munkáspárt", the ideological heir to the pre-1989 Communist Party) and to its leader, Gyula Thürmer – who also has good relationship with the Russians – infuriated several Hungarianists. We asked Thürmer about his relationship to Győrkös on Wednesday, but the leader of the Workers’ Party angrily hung up on us. But what is the GRU? The military's Main Intelligence Agency, abbreviated GRU was once the other Soviet intelligence agency existing besides KGB. And it still is: while KGB broke up in 1991 – its successors being the counterintelligence service, the Federal Security Service (FSB), the Foreign Intelligence Service (SVR) and other smaller organizations – the GRU remained intact and as the largest intelligence agency of Putin’s Russia played an important role in Russia’s encroachment in Ukraine in recent years. The GRU has units not only for regular intelligence tasks, but for special operations too (like diversion and deep intelligence penetration): the so-called "little green men" appearing without identification in Crimea were also partly from this agency. Spetnaz, the notorious Russian elite military formation was also founded by the GRU. As several “advisers” of the KGB sat in the building of the Ministry of Home Affairs’ III/I Directorate, i.e. the Hungarian socialist civilian intelligence, the 2nd Directorate of the General Staff of the Hungarian People’s Army (MNVK) – the Hungarian military intelligence – operated through a similar symbiosis with the GRU. After the democratic transition, the 2nd Directorate of MNVK was succeeded by the military intelligence of the democratic Hungarian republic, the Military Reconnaissance Office (KFH), while the Military Security Agency (KBH) became the successor of the Soviet-inspired III/IV Directorate of the Ministry of Home Affairs. In 2012, Orban’s government integrated the military intelligence and counter-intelligence agencies, establishing the Military State Security Agency from KFH and KBH. A foreign intelligence officer active before 1989 said to Index.hu that in the Socialist era, there was an extraordinarily high level of cooperation between the Soviet and Hungarian agencies which is regarded as unthinkable today. The Hungarian military services and their experts moving to civilian intelligence still have a negative reputation within the Ministry of Home Affairs and within the circles of the civilian units under it due to the ties of the “military branch” to Russia being considered too strong, to the closed nature of the organisation, to the lack of control over it, and to their pre-’89 mentality. For these, the most vivid example may be the case of the Roma murders. István Csontos, the quaternary defendant of the 2008-2009 serial killings was an agent of KBH (the Hungarian military intelligence) before, which it denied for a long time. Csontos even met his former officer after the fifth racist attack, the murder at Tiszalök, and was covertly referring to the reward of 100 million HUF. This meeting and the relationship itself was concealed and denied throughout the investigation process both by the KBH and the officer. When it finally came to light, proceedings were initiated by the court against the officer for making false statements, however, the internal investigation of KBH resulted only in disciplinary measures. According to Hungarian daily Népszava, the officer wasn’t dismissed because he was ordered by his superiors to make those false statements. A day after this article's Hungarian version was published, Hungarian newspaper Magyar Idők cited investigative records which show that István Csontos had contact with members of the MNA. 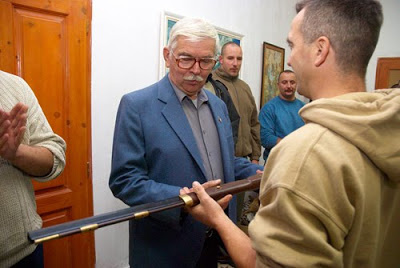 Magyar Idők also wrote that brand new Russian weapons – rifle, handgun and a scoped assault rifle – were found by the police when they searched Győrkös's home. Foreign Minister Peter Szijjártó stated in an interview in August to Index.hu that he has no knowledge of foreign diplomats having been expelled from the country due to espionage since 2010, and “surely not” after him taking office in 2014. The attitude of the Hungarian government is unique, since news about Russian spies masked as diplomats being declared as persona non grata in other countries of the region, for instance in Romania or the Czech Republic, could be heard on a yearly basis. The Czech counter-intelligence (BIS) has disclosed its yearly report in September, according to which the Russian services were the most active in the previous year (again), as they have been in every year since the outbreak of the crisis in Ukraine. The report states that their primary goal is to spread Russian disinformation and propaganda in the Czech media and internet, to subvert the unity of NATO and EU, and to increase Russian influence over the Czech energy sector. The Hungarian counter-intelligence agency (Constitution Protection Office) on the other hand, does not issue similar reports anymore. Specific statements about Russian activities in the country are made mainly by politicians, however, the validity of these statements cannot be checked. 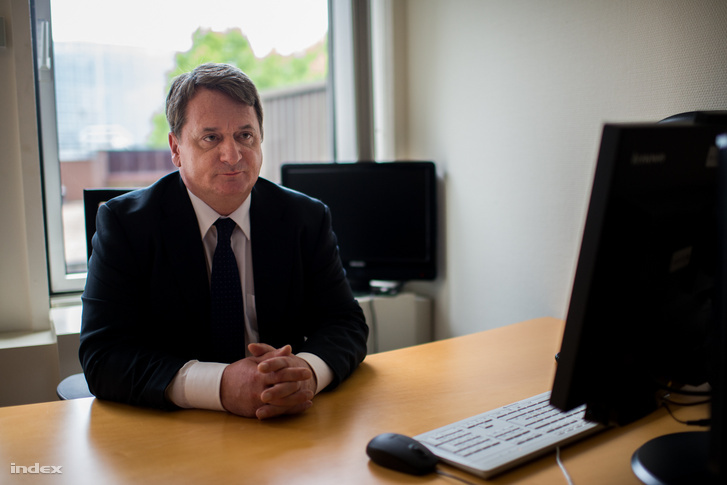 For instance, former prime minister Ferenc Gyurcsany recently talked about that according to his knowledge, there are 600-800 Russian secret agents operating in Hungary, twice as much as under his administration. This article was originally published in Hungarian. Translated by Zsófia Wolford.